It's never been difficult for people to find The Physics Classroom. It shows up quite high on most Google searches using common physics search terms. The URL is very easy to remember. And there are numerous links from other website that point visitors to our website. So exactly why have we added this section to the website? 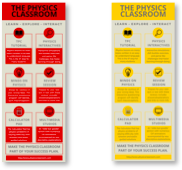 We've noticed that over the past several years, more and more physics teachers have decided to use The Physics Classroom as their textbook or their "go-to website." We're delighted about that and we hope to make it easier and more official-looking for such teachers to introduce The Physics Classroom to their students. So we have put together a variety of tools to make this official introduction possible. We've provided the tools and some suggestions as to how you can do this. 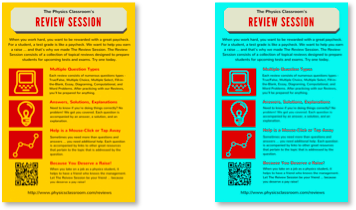 We are offering them as free downloads and encouraging teachers to use them during the first days of class and throughout the year. Finally, we suspect that as we try them out, we will have even more and better ideas. So stay posted. And if you happen to think of something yourself, then drop us a line and share your idea. What Can Students Do At The Physics Classroom? Ads for the SideBars of Blogs, Web Pages, LMSs, etc. Horizontal Ads for Course Pages, Web Pages, LMSs, Blogs, etc. What Can Teachers Do At The Physics Classroom?